Virginia Tech’s Department of Food Science and Technology Fermentation Program is one of the first programs in North America to earn recognition from the Master Brewers Association of the Americas (MBAA). 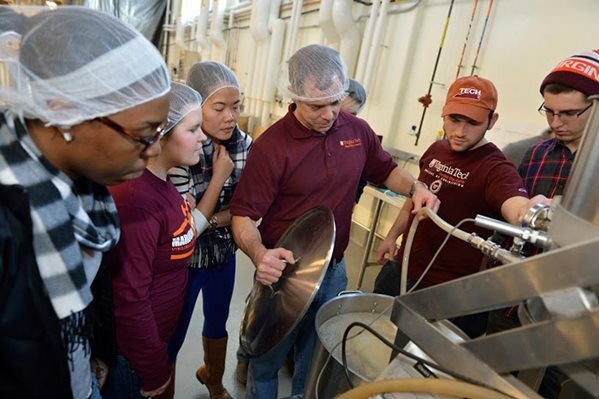 This unique educational program prepares students for careers in a growing industry, and the Virginia Tech College of Agriculture and Life Sciences is on the frontline of preparing a new generation of workers for careers in food science. The program is among eight universities in the United States and Canada to meet or exceed guidelines and learning outcomes established by the MBAA in the first year of the formal recognition process. The university opened a brewhouse last year that’s been a hub of innovation and education, with local and national brewers partnering with the university to find ways to grow their business and test their products. A 2.5-hectoliter, professional-grade Esau & Hueber system was designed for research on brewing ingredients, process parameters, outcomes, and innovations. The brewhouse and fermentation program are helping the commonwealth’s beer industry, which has a more than $8 billion annual economic impact and generates $2.9 billion in annual tax revenues, according to the Beer Institute. This recognition will help further those partnerships, with more than 4,000 Master Brewers members in 50 countries working to achieve mastery in every aspect of brewing with access to the freshest thinking in the industry. While recognition from the MBAA stems from teaching students how to make beer, there’s a lot more to the fermentation program. It is important in a wide range of food applications because fermentation is a vital step in food manufacturing in everything from wine and beer to cheese and yogurt production. The university is conducting cutting-edge research in the field. Holly Scoggins, associate professor of horticulture, is leading the hops production research program. An experimental hop yard was constructed at the Urban Horticulture Center with grant funding from the Virginia Agricultural Council and the Virginia Department of Agriculture and Consumer Services. Scoggins is hoping to determine which hop varieties are best-suited to Virginia’s shorter summer days and most resistant to Mid-Atlantic diseases and pests. Laura Siegle, Extension agent for Amelia County, has been working with growers in the state for the past few years and has authored and co-authored several publications on various aspects of production. MBAA recognition will help expose more students to the opportunities at Virginia Tech and help expand the program. The Master Brewers Review Board brings practical, scientific, and academic excellence to the process of both guiding and recognizing new and existing brewing and fermentation science programs at colleges and universities throughout and beyond North America. The review board is comprised of master brewers and leaders in brewing academia and human resource professionals from Sierra Nevada Brewing Company, New Belgium Brewing, MillerCoors LLC, Deschutes Brewery, Oregon State University, UC Davis, Dalhouse University, Skagit Valley Malting, and Joh Barth & Sohn Gmbh & Co KG. Virginia Tech joins seven other universities earning MBAA recognition in 2017 — Appalachian State University, Kwantlen Polytechnic University, Metropolitan State University of Denver, Oregon State University, Southern Illinois University, University of California-Davis, and University of South Florida-St. Petersburg.